In front of a raucous hometown crowd, undefeated cruiserweight Mike "White Delight" Wilson (19-0, 8 KOs) annexed the vacant WBA-NABA 200 pound title on Saturday night at the Jackson County Expo in Central Point, Oregon, taking a ten round unanimous decision win over Mexico's Mario Aguilar (18-4, 16 KOs). 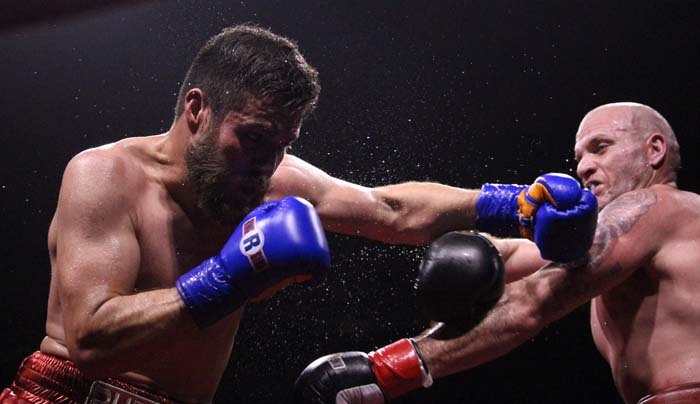 Headlining the ninth edition of White Delight Promotions' 'Rogue Valley Rumble,' Wilson used his longer reach and better movement to overcome Aguilar's crafty defense, consistently out landing his opponent en route to a shutout victory on all three judges' scorecards. The beginning of the fight was a tactical one as both fighters looked to set each other up. Wilson stalked patiently behind his jab in the first two rounds, moving at range and throwing straight rights when the opening presented itself. Aguilar did well in maneuvering away from a lot of what was coming his way, though, and seemed to be trying to time Wilson with his right hand, but the Mexican fighter didn’t throw enough to score with anything substantial. In the second round Aguilar began to let his punches go more often and found his mark on a few occasions, countering over Wilson's jab with hard overhand rights. As the round wound down Wilson upped his output, stepping in with sharp one-twos and lead rights, catching Aguilar as he tried to cut the distance. Wilson kept control of the tempo in the fourth and fifth rounds, working off his jab and drilling Aguilar with thudding hooks to the mid-section in close. A right hand from Wilson opened a small cut over the right eye of Aguilar late in the fourth round. The action picked up in the sixth with both fighters exchanging heavy punches, Wilson landing effectively with his right on the outside and Aguilar taking over in close. The round was a close one up until a big counter left hook caught Aguilar as he barreled his way into the pocket. Wilson followed up with a perfectly timed straight right, putting Aguilar on the defensive for the rest of the round. Wilson seemed to find his groove in the seventh, doubling and tripling up his jab and shooting his right behind it, catching Aguilar frequently. Wilson maintained a steady stream of offense for the remainder of the fight, mostly staying at a comfortable punching range and peppering Aguilar with clean combinations. In the last round, Wilson stormed at his opponent, pressing in close and wailing away, looking to do damage. Aguilar rallied back late and as the round ended, the two stood in a neutral corner and traded intensely, leaving the local crowd screaming in appreciation. All three judges scored the fight 100-90 for Wilson, giving him his nineteenth win as a pro and his first title belt. Aguilar, meanwhile, drops his fourth career loss. "Mario was tough," said Wilson of his opponent after the fight. "The guy grew up fighting… He's a fighter through and through and he pushed us. He was tricky. I felt like he was trying to set us up early, trying to come over the top with a right hand, so I was real cautious of that. He wasn't easy to catch, just a real slick guy. He busted my ear drum. I cannot hear out of my ear. He caught me with some good shots, but that's part of the game. Once my jab started working my right hand started landing well." With the win, Wilson now places himself in line for a world title ranking and perhaps a shot at a lucrative opponent, something the Oregonian has been working towards for some time. "We’re going to have a lot of big opportunities coming our way," said Wilson. "Boxing is a tough business. It’s a chess game. You have to be strategic with every single move you make, and this is a big piece that we just moved around the chess board. Hopefully we can go in for a check mate here pretty soon. Next, we'll talk with (Bob) Spagnola and see what we want to do. Probably come back here and defend the belt once then we'll see if maybe some bigger players get involved. I have some great support here and I love fighting in front of my fans, but it would be nice to go fight somewhere else, maybe go overseas. We’ll see what happens." Five fights rounded out the rest of the card, featuring fighters from around the Pacific Northwest. 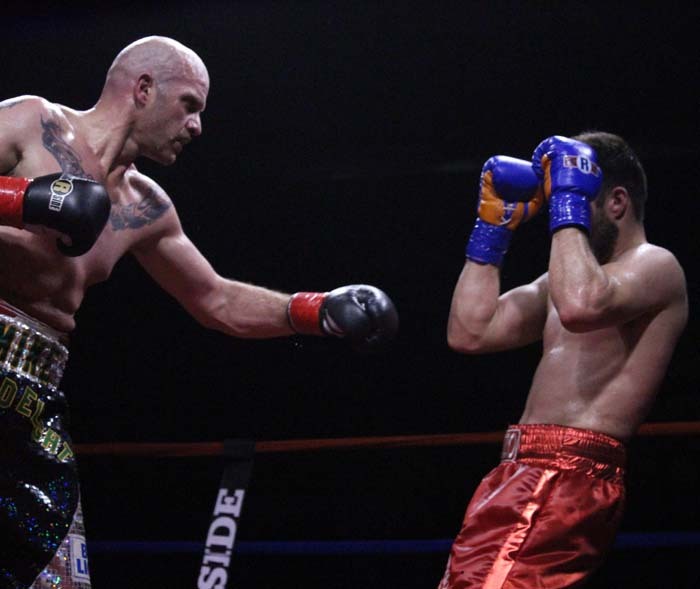 In a bloody, back and forth Jr. welterweight brawl, local crowd favorite Troy Wohosky (4-2, 1 KO) pulled out a split decision win over Salem, Oregon's Deric Bartlemay (0-7-2). Wohosky got off to a good start, landing the cleaner shots in the first two rounds, scoring from range as Bartlemay pressed forward. Bartlemay came on in the third round, unleashing a relentless attack, forcing Wohosky into close-range fight. The two engaged in some vicious exchanges in the fourth round, but Bartlemay's aggression was beginning to pay dividends as Wohosky began to bleed heavily and swell. Late in the fourth, Wohosky caught Bartlemay with a solid left hook that seemed to stun him. The two let loose in the fifth, neither wanting to give and inch, engaging in a fierce close to a solid battle. One judge scored the fight for Bartlemay 48-47, with the other two seeing it 48-47 for Wohosky, giving the popular local his fourth career win. 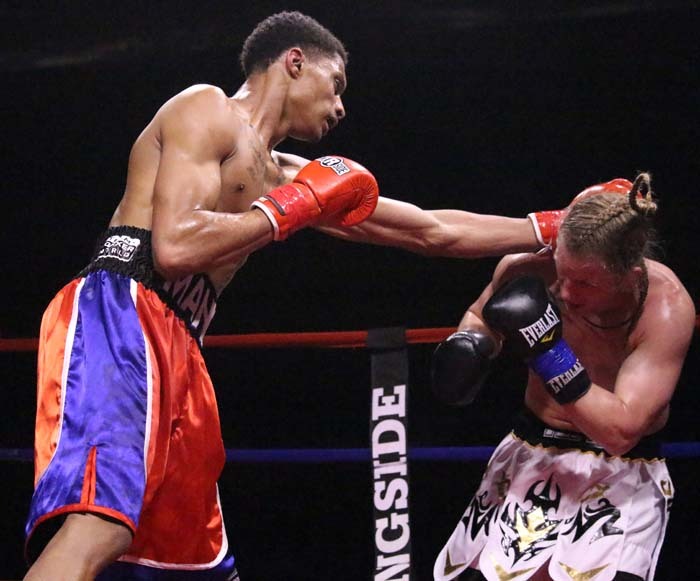 2016 World Series of Boxing winner Frank Sanchez Faure (4-0, 4 KOs) made short work of Des Moines, Iowa's Brian Green (1-2), scoring a KO in the first round. Sanchez, who trains out of Richard Steele's gym in Las Vegas, dropped Green with a three punch combo seconds into the fight. Green was still on one knee as referee Joel Scobie hit nine then, hesitating, he began to rise as the ref hit ten. The end came at :45 of the round. The bout was contested in the heavyweight division. 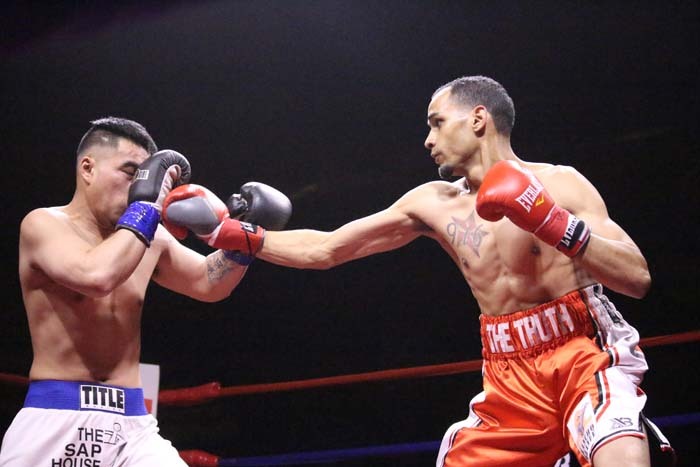 Tacoma, Washington's Nicholas Jefferson (4-0, 3 KOs) went the distance for the first time as pro in welterweight bout, outworking the game Brennon Crow (0-2), of Redding, California, over four rounds to take a unanimous decision win. Jefferson opened the fight with a left hook as Crow went to touch gloves, which drew some angry jeers from the crowd. Crow responded with some effective aggression and a few dirty moves of his own in the first minute of the first round, pushing his way in close and letting his hands go. Jefferson, though, began to show his superior boxing skills as the round progressed, countering well and holding when Crow began to get some momentum going in the pocket. Crow continued to press in the second, but Jefferson countered his aggression, catching Crow with precise hooks and uppercuts as he rushed in. Jefferson continued to land the more effective shots in the fight down the stretch, knocking out Crows mouthpiece repeatedly. In the fourth, Crow lost a point for not keeping the mouthguard in. Jefferson closed out the fight digging to his opponent's torso with hard hooks. Crow proved to be a tough fighter, though, taking the shots and continuing to press until the final bell. Two judges scored the fight a shutout at 40-35 with the last seeing it 39-36. A heavyweight fight between St. Petersburg, Florida's Mike Bissett (14-10-1, 8 KOs) and Sylvester "Doc" Barron (9-10-1, 3 KOs), of Anacortes, Washington, ended in draw. The fight, though entertaining, was marred by excessive fouling and a lot of holding. Bissett kept Barron on the defensive with his jab in the first round, but in the second Barron pressed, bullying Bissett back to the ropes and cracking him with heavy hooks. Both stepped up their offense in the third, engaging in short spurts of action before falling into clinches. Late in the round, as Bissett fell back into a corner, Barron rushed after him, coming up with a knee to the stomach as he cornered him. The move drew boos from the crowd and a stern warning from the referee. The fouling continued into the fourth with Barron throwing his opponent to the mat and Bissett returning the favor moments later pushing Barron down. Bissett closed out the round with an aggressive assault, doing enough to even out the scorecards. All three judges’ tallies read 38-38. 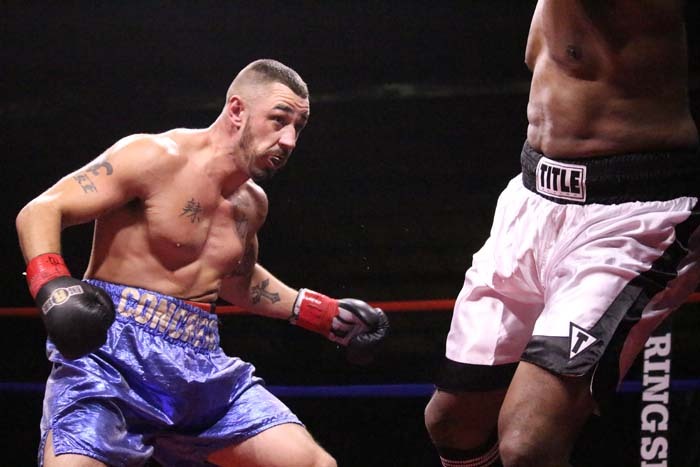 In the card’s opening bout, 2-time Golden Gloves champion Chris Johnson (1-0) made a successful entrance into the pro ranks, defeating Cottonwood, California’s Somethonit Phoumychack (0-1) by unanimous decision. Johnson, of Bend, Oregon, showed a solid skill set, controlling most of the action from range with crisp one-twos out of a southpaw stance. 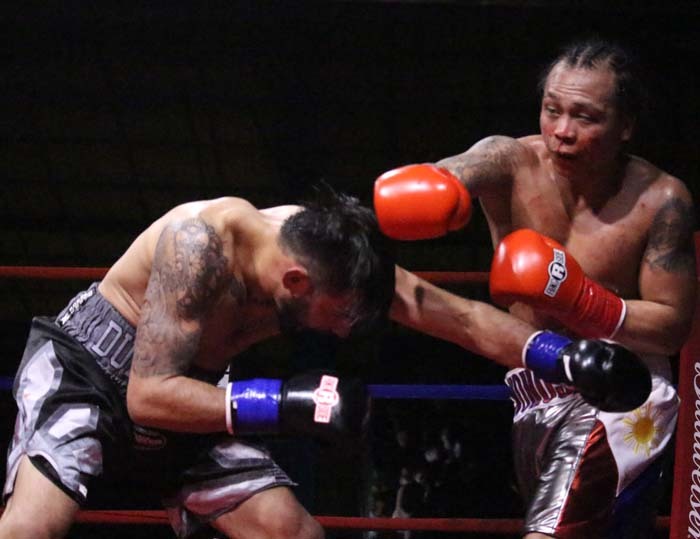 Phoumychack moved forward most of the fight, but Johnson proved to be an adept counter-puncher, catching him repeatedly with crunching hooks and uppercuts. All three judges scored the bout a shut-out at 40-35 and 40-36 twice. The bout was fought at the welterweight limit. A scheduled cruiserweight fight between Abraham Martin and Alberto Rivas fell apart when Rivas pulled out the day of the weigh-in. The event drew one of the largest crowds so far for the 'Rogue Valley Rumble,' nearly filling the Jackson County Expo, something promoter Jenifer Wilson was very pleased with. "We had an amazing crowd," said Wilson. "Everyone really came out to support. We had a lot of good fights tonight. Mike did an amazing job. He had a good opponent in front of him and he did what he needed to do just like he planned on doing. It was a great night." White Delight Promotions will hold their next event September 22nd.